Trump says United States is “doing well” in its diplomatic efforts with North Korea, says China making denuclearization more difficult. U.S. President Donald Trump said on Wednesday he thought the United States was “doing well” in its diplomatic efforts with North Korea. The statement came just days after he called off a planned trip to North Korea by Secretary of State Mike Pompeo. “I think we’re doing well with North Korea. We’ll have to see,” Trump told reporters at a White House event, according to Reuters. The President also pointed the finger at China for making the U.S. effort to get North Korea to denuclearize more difficult. "China makes it much more difficult in terms of our relationship with North Korea," Trump said, though he insisted his ties with Chinese President Xi Jinping were "great." "Part of the North Korea problem is caused by the trade disputes with China," continued Trump. “As for the U.S.–China trade disputes, and other differences, they will be resolved in time by President Trump and China’s great President Xi Jinping. Their relationship and bond remain very strong,” the White House statement concluded. On Friday, the President said he had asked Pompeo to put off his planned visit to North Korea, because Pyongyang was slow-walking efforts to dismantle its nuclear program. 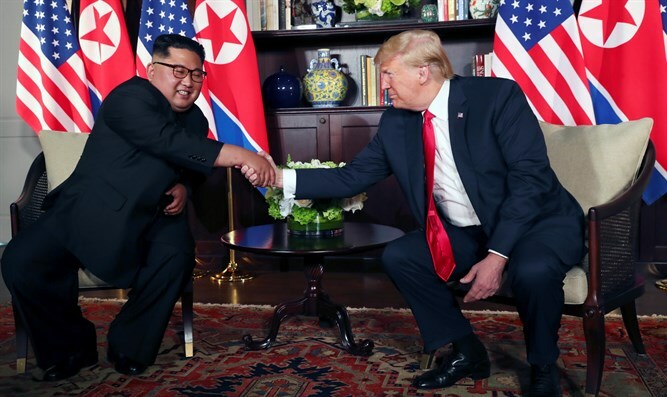 During a June summit in Singapore, Trump and North Korean leader Kim Jong Un signed an agreement which includes a commitment to achieve total denuclearization of Korea, with promises to pursue “vigorous negotiations” to that end. U.S. National Security Advisor John Bolton said recently that North Korea had not yet taken significant steps to get rid of its nuclear weapons project. Commercial satellite imagery released last week found that North Korea has halted its dismantling of the Sohae Satellite Launching Station, its only operational space launch facility.